With rising home prices in the DFW Metroplex it is no wonder why as a buyer, you might start considering going with a new build instead of a pre-existing home. Here are just some of the benefits that you get when deciding to go with a new build. Everything is new: Moving into an existing property can come with hidden costs, as you might need to make significant home upgrades that might not be entirely obvious during the purchasing phase. If, for instance, you purchase a pre-existing, 2,000 sq. ft. home and need to repaint the exterior, you can expect to spend between $2,300 and $5,400 on the project. Builder contributions: When purchasing a home, closing cost are often something that you need to consider saving for. When it comes to new builds however, you can often expect to get some help with covering a majority if not all of the closing fees. Annual savings: If your air conditioning unit is new, you can save a few hundred dollars a year by omitting the service plan normally carried with an older system. If you purchase an existing home, on the other hand, you can expect to pay around $5,230 for a new air conditioning unit. Design control: Everything is what you want from the start. You won’t have to spend additional funds redoing the home after you purchase it. One expense you might be spared with a new home: the cost of a bathroom remodel, which can cost between $9,000 and $14,000. Easier entertaining: Entertaining is easier because new homes often have an open floor plan that supports large groups. Older buildings often have some illogical design choices — like having to walk through a bedroom to reach a communal bathroom — that newer homes don’t have. No matter the route you decide to take in this exciting process of home buying, Jesse and I are committed helping you navigate though it all. 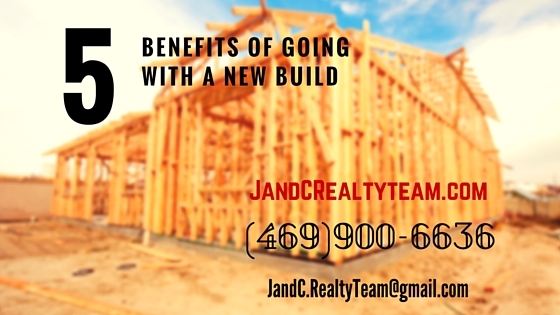 Please feel free to call us at 469-900-6636 or email at JandC.RealtyTeam@gmail.com to find out more.